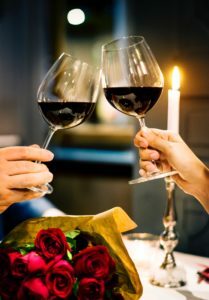 There are so many wonderful ways to celebrate Valentine’s Day with your special someone…we thought we’d make it easy for you and detail our top 5 romantic favorites. Schedule an Orchard House Bed and Breakfast Wine Tour. As a guest at the Orchard House, you may choose ourDeluxe Room package, which includes our popular chauffeured five-hour tour. It is customized to your tastes, and can include wineries, breweries, cideries, distilleries and more. A delicious picnic lunch is served at @veritaswinery, where the views are stunning and the wine is amazing! Surprise your Valentine with a couple’s massage. The Orchard House Bed and Breakfast partners with our local spa team to provide a romantic, healing, and blissful massage for two. The perfect way to either kick off or end your weekend of romance. Plan a tranquil hike in one of many local choices. Crabtree Falls draws guests from all over the nation, and it’s obvious “why”. The sounds of the breath-taking waterfall accompany you the entire hike, and the photo opportunities are at every turn. You can hike as long or as little as you’d like, check in on Facebook, take multiple pictures, and head out for a special lunch-for-two! Fortune’s Cove and Three Ridges are two gorgeous options close to us and appropriate for all fitness levels. Enjoy an elegant dinner for two at a plethora of local choices. Basic Necessities offers romance with a French flair, specializing in wine, cheese, and breads. All of the local Nelson County breweries are known for their great menus, unparalleled mountain views, and fun atmospheres. Nearby Charlottesville downtown mall boasts restaurants with any type of food you can imagine. Dinner for your Valentine has never been easier! Soak up the romantic vibe on the Orchard House Bed and Breakfast property. It’s all here on our 14 acres: a vineyard, a new gas fire pit with amazing starry skies, our cozy and welcoming front porch overlooking the mountains, a multi-course breakfast made from scratch, wine available from our very own grapes, and beautifully appointed guests rooms with private baths and comfortable beds. It’s easy to feel romantic, pampered, and special any time of the year here at the Orchard House Bed and Breakfast. We promise that your Valentine’s celebration will be magical and memorable if you opt to choose one or all five of our romantic suggestions!